It’s been a while since I really got to enjoy a Ratchet and Clank game. I tried playing All 4 One a while back, but the game kept freezing on me. I suppose it’s bound to happen when you buy as many games as I do, but that one along with Rayman advance not working definitely stung a little. I get the chills just thinking about those games. Into The Nexus was always notable for being very short and I can see why. You really breeze through the game. Considering that I took it down in a few hours while managing to die at least once in every level…it’s very short. I mainly just kept dying because I would forget about certain gimmicks. There were a lot of controls and no manual in the game so if you forgot how to do something…it becomes button mashing time. Still, it is a very solid game despite the length and there is a reasonable amount of replay value to be found here as well. Ratchet and Clank are serving as escorts for a pair of dangerous villains that need to be brought to jail. Unfortunately, they break free and murder two of Ratchet and Clank’s friends as they head off to destroy the universe. Ratchet decides to disobey orders to retreat back to home base and pursues the villains. This time it’s personal and Ratchet isn’t playing games. He’s armed to the teeth and is ready to make the hard calls. With the whole universe in the balance, Ratchet may learn that sometimes you need to have a backup weapon at the ready. Luckily, Ratchet always has a bunch of guns. While the gameplay appears to be the same as always on the surface, it’s less polished. You’ll quickly get used to the 3D shooting style as it’s made to be easy to pick up and play. I love 3D games and Ratchet & Clank has always nailed it. That being said, this one is missing a lock-on feature. You can use L1 to “focus” which is like locking on, but it won’t follow the enemy. You always have to manually aim while fighting. It’s not a big deal, but it can be a little inconvenient if you’re used to having a lock-on at the ready. Due to the size of the game, the weapon selection is also a lot more limited. You have less than half of the weapons that an average Ratchet & Clank game has along with half the gadgets. They each only have 3 base levels as well so you’ll max out the weapons quite easily. It seems like there are an extra 3 levels that pop up later on though so that helps. This makes the Platinum Trophy easier I suppose, but it still sounds reasonably difficult. The weapons that we do get are pretty good though. They’ll all old I believe so don’t expect anything new, but all of the good weapons made it back. All you’ll really need are the bombs and machine gun, but I do recommend buying the missiles and metal discs once you are able to as well. Earning money certainly isn’t hard in this game and just enter a few tournaments if you want some quick cash. It’s definitely worth the trouble. There are 5-6 worlds in the game and each one can be completed in under an hour. The tournament planet was probably the shortest plot-wise, but since there are bonus tournaments, it ends up lasting a little longer. As always, the graphics were definitely on point here. The animations were very smooth and the character designs were as sharp as you could expect. The energy attacks all look really good and I enjoyed the level designs as well. The game did a good job of grabbing the classic stage traits like a City level and a forest one as well. That’s definitely a good thing since every Ratchet game should have at least one City world. Those always look fantastic. The soundtrack never really stood out to me though and I couldn’t recall a single tune afterwards. Music is probably one of the only areas that isn’t a strength for this series. As mentioned, there is some decent replay value. Getting all of the trophies will take some time and that helps make the game worth the price. Even without the replay value, I think the game goes for around 10 dollars now. That’s certainly not a lot of money for an AAA title. The plot may not be as grandiose as the others, but it’s still engaging. As far as the platformers go, it destroys most of the competition. Only Jak can really keep up with it consistently and I’d still give Ratchet and Clank the edge. One thing that I can definitely get behind for this game is that the level up system is so smooth. Aside from your weapons, you can also level Ratchet up. It’s not particularly long or time consuming to power up, but you still don’t have to unless you want too. The bosses are definitely beatable if you want to go straight for them. There are also constant check points so even if you lose, you never have a long way to go. I think the phrase that I’m looking for is “Quality of Life” mechanics for this game. You never get lost for hours and hours like LoZ and you never have to go back through a long area with unskippable cutscenes like Orphen. Into The Nexus is a game that’s made with the gamer’s needs as top priority and it’s something that I’d like to see more games achieve. It’s easy to see why the series is known as one of the all time greats. Overall, This felt like a little treat for Ratchet & Clank fans to hold them over until the next full installment. I’d think of this as more of a spinoff than a full fledged game. Think of it as the mini adventure to keep you ready for the next big title like what Kingdom Hearts does. Of course, KH spinoffs are still typically at least 20 hours long, but we’ll let that slide for now. It’s short, but that doesn’t mean that Into The Nexus is any less of a good game than you’d expect. While it’s not as polished and complete as the others, I still had a blast playing it. The time really flies when you’re blasting the opponents. I’m definitely looking forward to playing the next game although I hear that it switches up the format a little. Hopefully it keeps in the fun and intensity of this game. 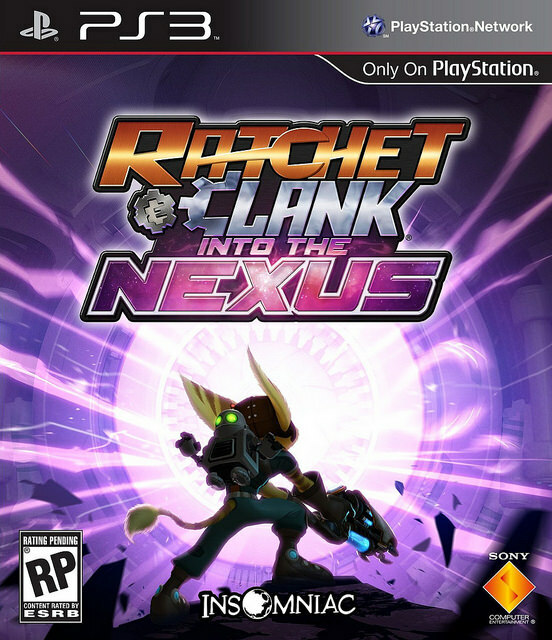 This entry was posted in 8 Star Games, Game Reviews, Games, Reviews and tagged Action, Game Review, Playstation, PS3, Ratchet & Clank, Ratchet & Clank Into The Nexus, Review, Sequel, Sony, Time Travel, Video Game Review by dreager1. Bookmark the permalink.